Leiden’s biggest cultural event of the year – what a success! Since 2007, you can experience music, dance, cuisine and traditions from various countries at the International Cultural Festival. Two weeks ago, it attracted hundreds of students both from the Netherlands and abroad as well as many locals to the Scheltema. Dante, Luuk and Sjors from the student association “Dinsdag Avond Club” are selling fresh ice cream of the “Odessa-Car”: We are looking for international students to join! Everyone is welcome, there is no easier way to learn Dutch and we take trips abroad: This year, we went to a Christmas market in Germany, Hitch Hiking to Belgium, exploring Prague and skiing in France. Came from the U.K. for Humanities! Damon from Scotland likes Leiden’s central location while Jake from Northern England enjoys the calm atmosphere. Eszter from Budapest moved to Leiden for a Master’s program in Psychology and has met people from all over the world. Her closest friends are from France and Italy. Anna from Calgary in Canada decided to do her exchange year in Leiden because of the reputation: Leiden university offers and excellent program for politics. Coming together from Shanghai, Sara Wang, Sabrina Xu and Michelle Guo appreciate the peaceful and calm ambiance of the Dutch student city. Their favorite place is the market which takes place twice a week. Having studied in Wales before, Diana from Colombia does her Master in Neuropsychology at Leiden University. She really likes the Dutch way of life while the foreign language challenges her. “I don’t even know what Dutch food is.” It is quite obvious what Alessandro, Enrico and Angelo miss the most from their home country. They are willing to try Dutch cheese though. Leonor will start her full Bachelor (IBP) this summer and Vanessa is doing an internship in Leiden at the moment. It is their first time in the Netherlands. 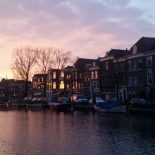 This entry was posted on May 30, 2017 by Anna@theleidener in Anna B., Culture, ISN, Leiden, Leisure, Living in Holland, Student City, Student Life and tagged culturalfestival, differentcountries, exchange, ISN, localcustoms, multicultural.